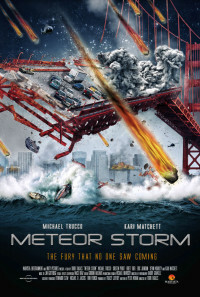 San Francisco becomes a target for waves of destructive meteors after a rogue comet orbits around the earth... For astronomer, Michelle Young, what was meant to be a once-in-a-lifetime celestial event, soon turns into her worst nightmare as thousands of meteors break the surface of the atmosphere and bombard the city of San Francisco. Regions are unavailable for this movie. Click the "Watch on Netflix" button to find out if Meteor Storm is playing in your country.